Hello! I love drinking tea. It's always nice to catch up with friends over a cup of tea or even enjoying it while having a meal. Tea has incredible benefits, it helps to detoxify your body, improve your skin, keep you fit and trim and it is high in antioxidants. 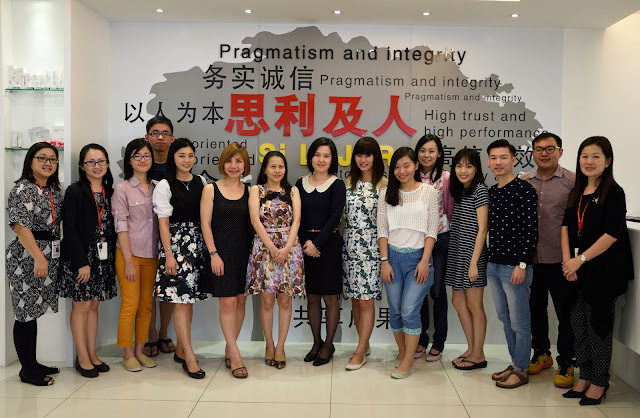 A few weeks ago, I was invited to a blogger get together with Infinitus and was introduced to Infinitus Dried Tangerine Peel Pu'er tea. Infinitus Dried Tangerine Peel Pu'er Tea is made from premium quality fermented pu'er tea from Yunnan and tangerine peel from Guangdong. The natural goodness of these raw materials is extracted using modern technology to create a special blend of healthy and tasty cup of tea. 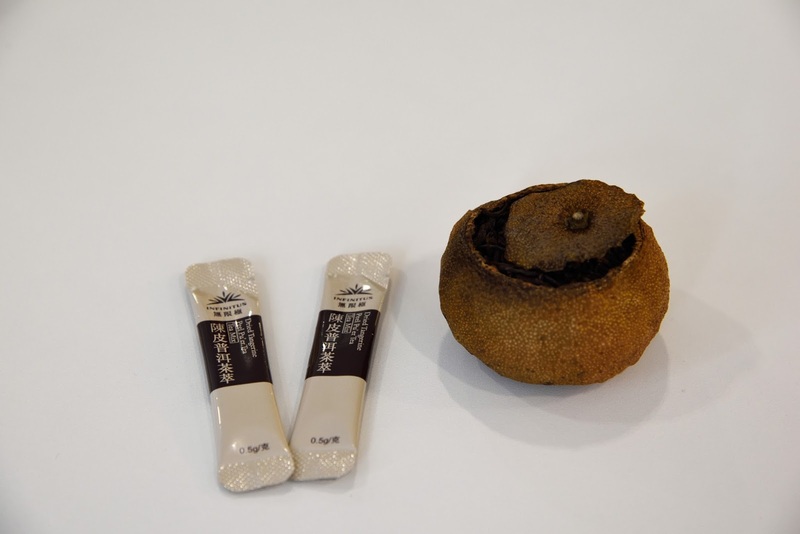 Pu'er is well known to have good astringent quality that helps to neutralize fat, warm the stomach, while tangerine peel strengthens the spleen. When blended together, it will help our body remove excess oil consumed and reduce stress on our digestive system. 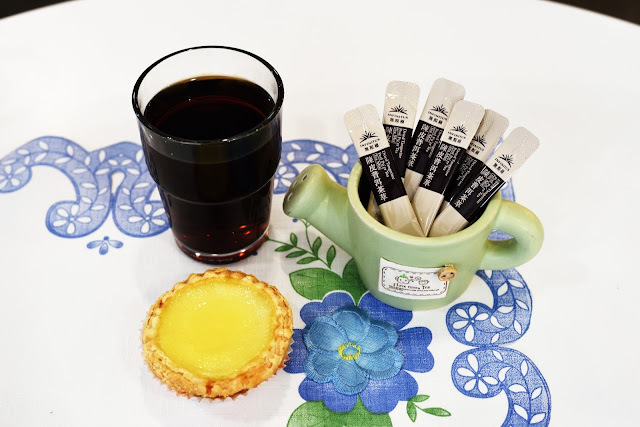 With Infinitus Dried Tangerine Peel Pu'er instant tea beverage, gone are the days where we need to go thru the tedious step by step of tea making. It comes in a convenient sachet form, to save you from the trouble of loosening the tea, sieving and cleaning of used tea leaves. It is designed to suit the rapid pace of modern living, healthy, trendy and convenient to prepare, making it suitable for long-term consumption. 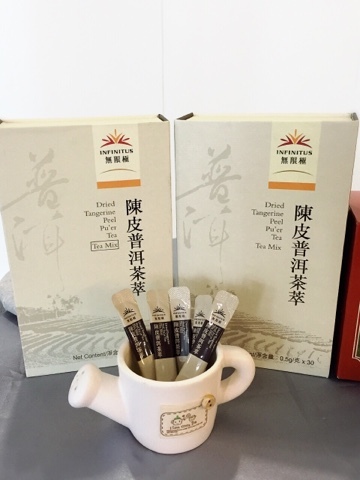 Made from a selection of high quality raw materials, the tea is extracted, filtered, membrane concentrated and freeze-dried using advanced technology to preserved the scent, taste and active ingredients of the tea. 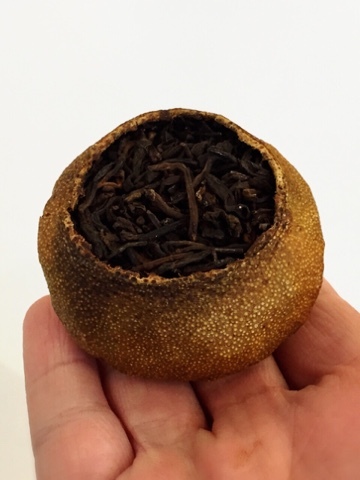 The traditional form of tangerine peel pu'er. The tea beverage exhibits the bright colour, fragrance and taste of fresh premium tea for the ultimate experience. Robust and rich, I prefer my cup of tea piping hot. I love the easy to carry sachet and convenient to prepare, no matter I'm at home, office or on the move. 1) Tear along the incision. 2) Pour the content into a cup. Now I can enjoy a good cup of dried tangerine pu'er tea anytime and anywhere. Group pic with the fellow bloggers. Thank you Infinitus for having us.